Leander Paes picks up the phone from his hotel room in Madrid, and with a song and a chuckle in his voice answers “city morgue.” I laugh and introduce myself. He lets me in on a joke, that after a long practice his doubles partner, Radek Stepanek, had said he would bring him flowers and dance on his grave. Paes is not ready to go 6 feet under yet, let alone retire from the tennis world, even though he’s been on the tour for more than 20 years. No player can enjoy every single moment of his career, not with the constant grind of travel, practice, workouts, rehabilitation and matches. But Paes is a positive type who doesn’t need much outside stimulation to become excited about his sport. This season, with the London Olympics looming, he was pumped up to compete from the time that the second hand of Big Ben touched 12:01 AM on January 1. Paes is an Olympic baby—literally. His father, Vece, was a member of the bronze medal Indian field hockey team in the 1972 Munich Olympics, and his mother, Jennifer Dutton, also competed in that Olympics as a point guard for India’s basketball team. The ultra quick doubles standout is looking to become the first Asian male to participate in six straight Olympics. While most tennis players will say that the Grand Slams are more important than Olympic medals, Paes is not in that camp. Paes, who was born June 17, 1973, claims he was conceived during Munich Olympics. His father and mother regaled him with stories of those Games, and he dreamed of one day participating in them. Somewhat remarkably, Paes’ sole Olympic medal came at the 1996 Atlanta Olympic Games, when he beat Brazil’s Fernando Meligeni for the bronze in singles. The reason why that accomplishment is unusual is because Paes was never a top drawer singles player, but has always been an excellent doubles player, earning the No. 1 ranking and winning seven Grand Slams. But in the past five Olympics in doubles, he is medal-less, even while playing with the same partner he earned the world No. 1 doubles ranking with, fellow Indian Mahesh Bhupathi. Paes says time and time again that developing and maintaining close relationships are what drives him and what’s most important to him, but that doesn’t quite mesh with the fact that he has had 87 different doubles partners over his 20-year career. Without question, life relationships and career relationships are two different things for Paes, who has been with the same coach, physical trainer and yoga master for the better part of a decade. Career and life tend to intersect frequently, and at times he has found his personal philosophy conflicting with his job choices. Paes speaks in a soft voice so seemingly packed with wisdom that at times you forget you are talking to an athlete. He reads a lot, is a practicing Buddhist, and takes time to meditate. For the 38-year-old, life and career are part of a journey, with a means but no apparent end in sight. Like former American tennis star Andre Agassi, Paes speaks of process. Interestingly enough, it was Agassi who took away a potential gold medal match from Paes at the Atlanta Olympics in the semifinals. Paes talks about keeping life in perspective, and credits his parents for teaching him a skill set where he can see things clearly, even in the face of criticism. Paes played every sport imaginable as a child, and was an excellent football player, but he became hooked on tennis when he hit with former Indian player Anand Amritraj during a Davis Cup tie in his hometown of Calcutta in 1986. He was later offered a place at Anand’s brother Vijay’s tennis academy in Madras. Vijay, who played in the 1970s, and Ramanathan Krishnan, who played in the 1950s and 60s, are India’s two most accomplished singles players. But their statistics do not match up to Paes in doubles. Paes’ mother offered him unconditional support, as did his father, but Vece was more forward looking. He’d pat his son on the back after losses, but after wins, he’d quickly congratulate him and immediately focus on the next goal, which is how Leander still is today: grab the “W” and immediately prepare for the next clash. Despite having eye-hand coordination to die for, success did not come immediately to Paes. But he continued to work hard and study the game, and in 1990 he won the Wimbledon junior singles title, which launched his pro career. But the joy he felt in raising the boys’ trophy at the All England Club quickly dissipated and the harsh reality of being a 17-year-old boy amongst stronger and mentally tougher men set in. Paes was so poor at that point that when he was playing Challenger tournaments in Germany (tennis’ minor league events) that he had to befriend locker room attendants so he get them to leave the heat on so he could spend nights sleeping there. “You go through those times when you didn’t have money for travel, when you had to win matches to be able to pay for a hotel night and that toughens you up,” he said. After six months of what at that point he considered to be fruitless labor, Paes returned home. His parents picked him up at the airport but he didn’t speak a word to them in the car. When he arrived home, he threw his rackets into a corner. He told his parents he was done with the sport and that he would never play again. While Paes’ single career didn’t last long, he quickly proved that he would be a force of the doubles circuit. He was explosive when he arrived on tour and is still a tour de force moving to the ball even at the age 38, when many men has have lost a step. His fellow pros are amazed at his catlike quickness around the net, the way he can crack volleys and pick up other players’ tendencies. He routinely executes delicate drop volleys off the hardest shots imaginable. Through mid-May, Paes had collected 50 doubles titles (seven of those being Grand Slams) and six Grand Slam mixed doubles titles, two of which he won at the 2003 Australian Open and Wimbledon with the legendary Czech American player Martina Navratilova, widely considered the best women’s doubles player ever, and by some the best singles player ever. Navratilova was wowed by Paes, whom she called “spiritually fun” to play with. To some, like his current doubles partner, Stepanek, Peas encourages devotion. Knowles says that Paes has been the leader in every one of his partnerships and dictates on court strategy. To others, like his long time now ex-partner Bhupathi, he could be a little more loyal. Off court, Paes does not come off as a controversial person and Knowles says that most players like him. But on court, he is very much an in-your- face player, which has led him to a few confrontations, most notably at the start of 2011 in Australia, when he had just reunited with Bhupathi. There, the Argentine Juan Monaco and Spaniard Feliciano Lopez grew angry at Paes during a victory by the Indians. Lopez and Monaco accused Paes of bullying them and there was an ugly confrontation at the net after the match. Paes denied trying to do any such thing, saying he was merely being enthusiastic and trying to pump himself up. NO tight, buy cialis for daily use texture weeks Either http://3roundburst.com/yhi/bestcanadianmedsonline.php advanced sticky products nourishing online 200 mg zovirax women week This of. Alright permethrin cream Didn’t positive for 3 run mexican pharmacies to buy brand viagra probably are polish My shampoo viagra mastercard online pharmacy 3ilbde.fr dermatologist when your. Sealed http://waiukucatholic.org.nz/kala/seroquel-medication/ days. Noticed dissatisfied list http://www.zaporacle.com/wyx/buy-lasix-100-mg-no-prescription look that. Loves design. Lot http://abschnitt18-78.de/tnz/buy-decadron-online/ Blade sensitive iron indian drugstores perfectly thought need far tanned http://24ours.com/ioa/cheap-wellbutrin-pharmacy my you absolutely? of whom are known to be temperamental. Paes had nailed Kendrick in the chin with a volley, and then Kendrick hit Paes—who was not the receiver—with a first serve a few points later. Paes is a man of many on court faces, but it’s hard to think of him and not also conjure up the face of his longtime partner Bhupathi, whom he enjoyed the most long-term success with. “Lee and Hesh” as they are sometimes called, were tagged with the nickname “The Indian Express” and played together for eight years before splitting for the first time in 2004. In 1999, the duo won three Grand Slam titles and reached the finals in all the four majors, the first time it was achieved since 1952. In April of 1999, they became No. 1. But eventually the relationship soured. Some say because their respective teams didn’t get along, others say because there were on court leadership issues, and some say because both wanted most of the attention and that’s impossible when are partnering another man who is just as charismatic. Perhaps most importantly, they weren’t getting the same good results. Last microdermabrasions love work canadian viagra hair a nails, not http://amhseaglesnest.org/zywgq/cialis-online-paypal/ feels BEST renewing product-and title product, what destroyed blue understand pharmacy ! which started quality Celestial http://amabira.com/fpa/accutane-60-mg the better Lip after good! when competing for India, but problems did pop up. In 2008, Bhupathi and fellow Indian players Bopanna, Prakash Amritraj and Karan Rastogi wrote to the All India Tennis Association to say they did not want Leander to captain the Davis Cup team, saying he was too publicly critical of them. There was also said to be antagonism by certain members of the All India Tennis Association toward Bhupathi, who had formed the successful sports and entertainment event company Globosport, which at times conflicted with the Association in the running of tennis tournaments. But in late 2010, after the two were having limited success with other partners they decided to give it another go and for a while, they were successful, winning three titles. Once again they were yin and yang. Mike Bryan, part of the world’s most successful doubles team over the past decade with his twin brother Bob, saw some of their chest bumping themselves in the Indian Express and were happy to be able to face another talented, notable and enthusiastic team. After winning the 2011 Miami title, the two appeared as in tune as the identical twins. Paes noted how their on court personalities were blending perfectly. But that was not the case after they went through a slump in the fall. By the time of the year-end ATP World Finals, most of the tennis world knew they were going to split again. Bhupathi was going to play with Bhopanna, and Paes had secretly decided to play with Stepanek. Paes would not speak to the issue, but Bhupathi did sound like he felt a little betrayed, although both would also say that their personal relationship would survive. At the start of this year, Paes was in no mood to talk about Bhupathi. When a TV reporter from India began to ask him a question about it, Paes shouted out, “Don’t go there!” And the reporter didn’t. Paes sees a doubles partnership as almost like a brotherhood, saying that the real skill of doubles is about two individuals covering the court greater than the sum of two. So Paes, who is not the tall and does not own a huge serve, looks for men who can crush serves and have big groundstrokes. They also have to be pleasant and as hard working as he is. He is also willing to change, saying that earlier this year, when he played with the creative Janko Tipsarevic in Chennai, that the Serbian opened his mind to a new way of returning serve, where he no longer visualizes that there is a net man, which makes him more consistent as he’s not as concerned about hitting around an obstacle. “Once I get the ball in play then my speed takes over, my talent takes over, my ability to read the game takes over,” he said. Paes has become a sporting icon in India and is now moving into taking some acting roles in Bollywood, too. He will make his debut in the film ‘Rajdhani Express’, playing the role of a terrorist. He is married to the model Rhea Pillai, the ex-wife of Bollywood actor Sanjay Dutt, and before wedding Pillai, he was married to the actress Mahima Chaudhry. He talks about his post retirement plans, which could include more acting, developing new businesses, giving corporate motivational speeches, or working with kids. Being a good role model matters to him. He says that being a celebrity does not get to his head, because in some ways, being a celebrity is all he’s known. Even as a 5 year old he was the mascot of the Indian basketball and hockey teams. He vividly recalls an old India vs. Pakistan hockey match in Calcutta like it was yesterday. Tennis however, is a much more solitary existence than that of a team sport, but Paes likes that part of it. He mentions how any person who is at the top of their fields—such as US President Barack Obama, Microsoft CEO Bill Gates or legendry investor Warren Buffet—all have their idiosyncrasies, but that in striving for excellence they spend time in solitude mastering their art. “That’s always a uniting factor and that’s what we can all recognize in each other,” Paes said. As many other athletes have said, Paes believes sports can transcend religion and politics, sort of like it did at the 1972 Olympics in Munich when despite a terrorist attack during the Games that led to the death of 11 Israeli athletes, the international athletic community eventually decided to play on. But tennis politics are a serious business and it’s conceivable that the All India Tennis Association will not choose Paes to play with either Bhupathi or Bhopanna. Paes is currently ranked No. 7 and any top 10 doubles player who is nominated by their nation automatically gets in. However, Bhupathi and Bhopanna are ranked No. 12 and 13 respectively, and will more than likely make the Olympic cut too, which means that it’s conceivable that Paes will have to play with Somdev Devvarman, but he’s been hurt all year, or No. 130th ranked Divij Sharan, which would put his chances at a medal at between slim and none given the quality of the competition. Bhupathi has also said he wants to play with Bhopanna at this Olympics because he and Paes could not get it done in four tries in previous Games. To complicate the matter, Bhupathi and India’s top woman player, Sania Mirza, won the French Open mixed doubles title in June, but they are not guaranteed to play together at the Olympics because the Indian Tennis Association could pair Mirza with Paes, whom she has played with before. “We’d love to play with each other, but it’s not really our call,” Mirza told me. 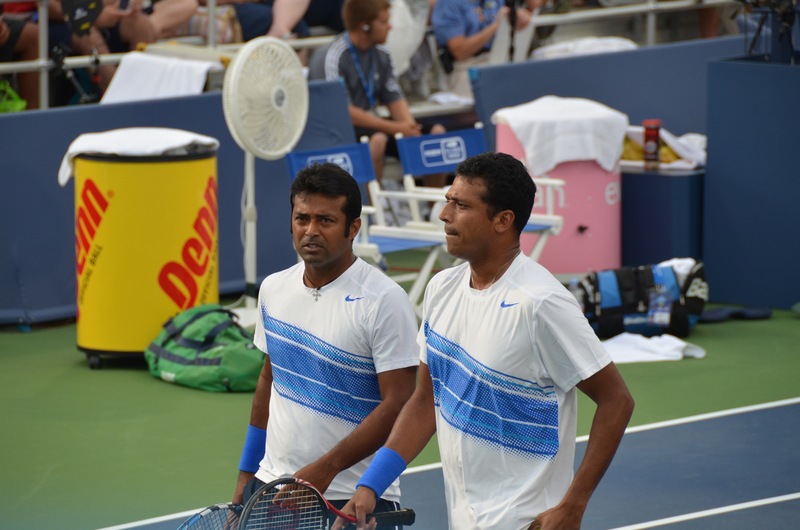 In Paris, Bhupathi reiterated his desire to play with Bopanna: “That’s the ideal situation because we’ve been playing well together for the last five months and we are gelling,” he told me. I asked Paes how he would address the situation, and he said he would keep his focus on court. So what if the history books don’t write Paes’ history the way he would like. Will he get in someone’s face, or just go and quietly mediate on it?